On 22-27 July 2018, ITPC was in Amsterdam in the Netherlands for the 2018 International AIDS Conference (AIDS 2018). With support from the Robert Carr Fund, Open Society Foundations, and Bridging the Gaps initiative, we were able to ensure treatment access issues were brought to the center of the conference. On Sunday, July 22nd, 250 activists from around the world gathered in Amsterdam for ITPC’s Community Activist Summit pre-conference event. The Summit provided an opportunity for the group to reflect on the state of activism today and how to address our most critical problems in new and innovative ways. Check out the three key outcomes of the Summit here! Organizers of the Treatment Networking Zone guided activists on an informative walking tour through pharmaceutical stands exposing the truths behind Big Pharma’s lies! You can bet your @$ they had a good time! Tours were given daily! See more photos on the Make Medicines Affordable Facebook page! ITPC Executive Director Solange Baptiste explained home why treatment education remains central in the fight against HIV at the satellite session on differentiated service delivery (DSD) hosted by IAS and WHO on Monday morning. Learn more about our work on DSD! Activists demanded access to dolutegravir (DTG) for women across the world during the WHO satellite session introducing the new treatment guidelines and the role of DTG in first & second line treatment regimens. Learn more about the latest discussions around DTG. Our Make Medicines Affordable campaign launched the augmented reality feature of the #PharmaLies app allowing conference delegates to scan & reveal facts in Gilead’s, ViiV’s, Abbott’s, and MSD’s booth. ITPC Activist Development Programme veteran Mercy Ngulube delivered powerful remarks at the opening ceremony reminding everyone that our activism is our responsibility! Youth leaders are proudly leading the way in creating new and bigger spaces in the response. Learn more about our Activist Development Programme! ITPC’s Wame Mosime co-moderated the highly anticipated session on safety of dolutegravir (DTG) in pregnancy which presented the late breaking findings, interpretations and implications for treatment access and programming. Get all the latest information from the panel’s presentations here! 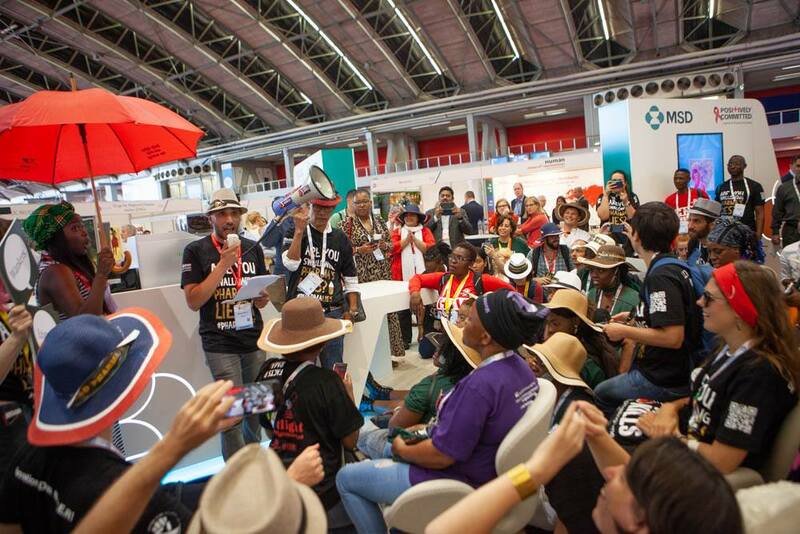 Lorena di Giano of FGEP in Argentina spoke at ITPC’s press conference, Cutting Through the Noise at AIDS 2018, explaining how political agendas impact access to medicines, one of the major themes from the Community Activist Summit. ITPC’s Wame Mosime moderates a oral abstract session on community financing for a sustained response that showcased data and experiences on current funding trends, building sustainability, and community entrepreneurship. ITPC MENA hosted four sessions in the ‘Ending AIDS crisis in MENA’ networking zone covering a range of issues — including innovative social media outreach campaigns, HIV and the law, HPV, and community advocacy for malaria elimination. See more on their Facebook page! Treatment activists discussed the transition to new ARVs during a session in the GNP+ networking zone. ITPCru’s Sergei Golovin shared insights from their recently launched report monitoring availability of ARVs in 7 countries in EECA. Read the full report here! ITPC’s Trisa Taro presented the key messages and outcomes from Sunday’s Community Activist Summit during the special session on pre-conference report backs. See all the special moments from the #ActivistSummit here! ITPC’s Othoman Mellouk spoke on a session about the politics of PrEP reminding everyone that there is no ‘one size fits all’ approach. Learn more about our work around PrEP! ITPC’s Solange Baptiste shared the community perspective at a special session on monitoring new ARVs hosted by WHO. The session focused on toxicity monitoring to inform treatment policies.